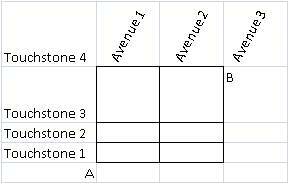 A race car driver has to drive from the intersection A to intersection B along the route that is confined to the square grid of four touchstones and three avenues shown in the map above. How many routes from A to B can the racer take that have minimum possible length? cant we solve this by combinatorics ? grockit gives solution via counting which is cumbersome. C is the quick answer.